Available Now! 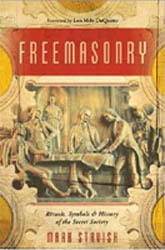 – This fascinating exploration of Freemasonry takes you inside a three hundred-year-old society and its secret symbols, rites, and practices. From sacred geometry to legendary Masonic rites, Mark Stavish also divulges the philosophy of Masonry and the moral code that all Masons share. How is Masonry linked to King Solomon, Gothic architecture, magic practice, and Qabala? How are Masonic temples talismans of virtue? What is the significance of the Tetragrammaton, the Pentagram symbol, magical writing, and amulets within Masonic practice? Stavish answers these questions and sheds light on other mysteries, including initiation, the degrees of Masonry, Masonic clothing, and the secret Masonic Word. Structured like a textbook, each chapter features a summary of key points, assignments, and suggested reading-for those who want to enhance their understanding of the Masonic tradition.